Club Penguin Cheats by Mimo777 Club Penguin Cheats by Mimo777: Whoa! 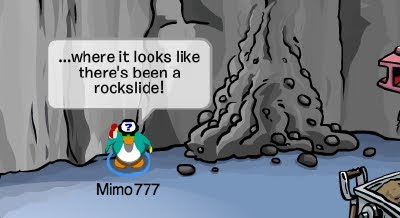 Check out the Club Penguin Mine! Check this out! If you go to the Mine take a look at the pile of rocks! Check it! When you give a tour in the Mine, it says there has been a rock slide and we need to dig away the rubble. Cool i didnt notice that! OH! I SAW THAT! I was thinkin it's always been there, but, i guess iwas was wrong! theres a new fairy fables login screen! i dont no how to take pictures but plz give me credit! hope so thought the new mission would this Friday I'm getting pretty bored of waiting to be honest. Mimo,here is my basic idea of what could happend:Herbert found a puffle (Red,black or white,just check EPF puffles)And he will try to steal the boiler as he did once (mission 8).Now i think i know what the pack seeds are.They are O berry seed (it LOOKS like a package of orange seed).So he trained the puffles and now he will try to do something... with puffles(maybe). i think Herbert will Steal the puffles so we can't have them. It makes sense. WAIT! Mimo! Remember the cave igloo furniture! This could be a new cave room or mission! see i told u mimo! do i get credit? It's obviously for the new mission. You know,its more like a mission,because its a rockslide.If it were a construccion,there would be free helmets and a sign saying:Help Build a tunnel.Well,we will have to wait.But its more like a mission than a construccion,because it was from the inside,not from the outside. ok this may seem warped and weird but ithink that that may be a new entrance to that underground tunnel system u thot might be there! Hmmm..... welll there WAS a super hero and that space themed play. So if you really think about it, they are just evening it out. Anyway, yeah, peace! First of all skool is CANCELLED because of the snow! YAY! Second, whoa! I do think Herbert is digging a tunnel or something, it's purty suspicious! wow... this tottaly screams new mission so keep a look out for messages on the hq board! ~~~~~~~~~~~~~~~~~~~~~~~~~~~~~~~~~~~ erm actually i thought card jitsu water was at the ninja hidout. u know the fire entrance cames from beneath the wooden bridge? I thought like water or snow would come from the other bridge? And the last one would come from the steps infront of the shop! Kkkkkk123(CPG MOD) GO CPG7 OR 8! ME TOO! I love school! Yah, you're right. It's more like a mission! OK EVERYONE I HAVE AWESOME NEWS! MY MUM BROUGHT ME CLUB PENGUIN CS GAME!!!!!!! SHE WANTED TO GET IT ME FOR CHRISTMAS BUT COULDN'T FIND A GOOD OFFER!!!! P.S. Sorry for the caps, just awesome news! Maybe- but i doubt it! Good it's the animal kind of mole because I do not want to be save cp againest the other kind of moles, though that would be funny. I think it`s a new room cause remember on halloween when we were trying to find the lab, well that is were you enter when you fond it. i think it has something to do with the post on the blog remember the one about NEW THIS YEAR (there was a bear,puffle, squid) i think it has something to do with herbert maybe a new room ??!! or shortcut to the petshop!! WOW THIS IS MAJOUR EVIDENCE! but i don't know what it could be for. Has the lamp always been burning? I haven't seen that before!! I think club penguin is going too have a new room!! WOAH! This is awesome! Im pretty sure new mission is coming really soon! I think it has to do with a new mission or a cave party! Maybe they will make a new room for the cave or mission party idk but this is getting coolio!!! i just got a brainwave! this could be a new room and a mission but it could lead to somewhere with water where there is a squid and it could be underneath the pet shop! gasps. ok i can breath now! ok this is probably wrong but i said just incase. 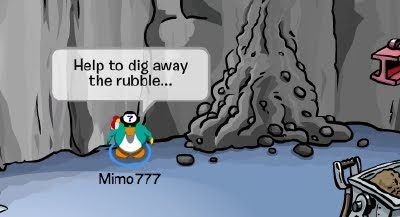 Yo Mimo777 I think it is Gary the Gadget helping to clear up like the festival of flight so that means we get mining hats again but in the mission herbert will come there, oh yeah u mentioned herbert he will use robots to steal puffles like in the EPF mission DS Game oh and he will try to get aa golden puffle because we never told him it is a lie. We know u can only get it by tipping the ice-berg not from the mine. oh yeah thanks vicyorus he will use the o'berry's to attract puffles. Definitely coolio! GASP *Lightbulb flickers on above head* Maybe they are having a prehistoric party with all the cave stuff like you said! It must be uncomfortable to sleep on cold hard cave floors...! Hmm...Good theory! (Yeah but probably wrong, lol!) I think it's pretty cool. Mimo loves hearing all the cool ideas we have!...Right...? 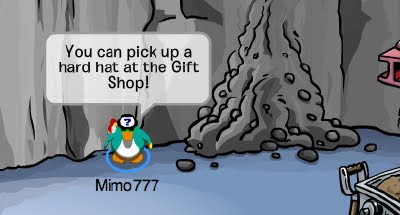 i think they're finally putting this penguins to work thing seriously and they acctuly made it so you can work and im sure the rock will be gone by next clothing cataloge! I think it is something to do with the new mission thats supose to be coming out, there might be a mini party and that little pile could be a sign of a land slide to cause a mini party on the bigger lan slide that might happen! Well it could have to do with a new mission we have been begging for. OOH!!! Maybe herburt IS digging a tunnel but in the mission we stop him and THEN cp turns it into a new room! So it could be both!!! Where does Sensei live and why?and i have another question :are sensei and rockhopper family? I get the feeling it's got to do with Card Jitsu Earth. If you look at the center gem in the card Jitsu amulet, it's black. Compare that color with the color of the walls in the mine and presto!, Card jitsu earth. Yeah, I commented on your last post about this. i think the new puffle is the brown puffle! the lamp is always burning, yes, but also in some parties it changes to another type of lighting! that's a really cool idea! I have no idea, but that does made a lot of sense! I wonder what it is! can't wait for the new mission! i think it has something to do with the post on the blog remember the one about NEW THIS YEAR (there was a bear,puffle, squid) i think it has something to do with herbert maybe a new room ??!! or shortcut to the petshop! Everyone has been waiting so long for the new mission it definitely could be with Herbert! a new room or a shortcut to teh pet shop would be cool! those are all great guesses! I'm sure if your the first one to tell him mimo will give you credit! I think so, I'm not completely sure but why wouldn't it be burning? I'm almost certain. That would stink, but I don't cp would do that, especially without any major holiday to celebrate. it could be part of the new mission. ...Great questions! I doubt that Sensei is part of RH's family, but you never know! finally! i think that's stage one of the new mission!! Nothing like that occurs unless its a party, or mission. And since no parties were announced yet, NEW MISSION NEXT MONTH, sadly. Actually bad things do happen in CP... Last year in febuary there was an earthqauke on CP and there was distruction everywhere! MeggyMcmHas said... Has the lamp always been burning? No one knows where Sensei lives! And Rockhopper & Sensei arnt family! They both have hats and beards but they are not family! Yes!! I'm allowed on the computer! Unfortunately, I'm not allowed to get on the computer on school/week days. It makes perfect sense now! In the DS game, the robots messed up the mine, and we saw robots in the "Holiday" party. So the next mission MUST have to do with the robots and the mine. What do you think? I don't think so, I think it is either connected to card jitsu or a new mission! They just had the Volcano in November. I don't think so. Oisin: Nope, it's probably a mission, because they always have some changes on CP to lead up to the mission! Oisin: Sensei lives high in the mountains, where he learned and taught us to play Cardjitsu! And, no, I don't think Sensei and Rockhopper are family! Hey people! I just met Polkadotblu9! I was in the mine, when I see a name that looks familiar. I check it out and it's Polkadotblu! It was so ironic. Now I am buddies with a mod! When the earthquake mission came out, there was an earthquake in the town outside of the mission! It was weird, we just randomly met. Yup! I don't notice those kinds of things though. You don't make any sense Hnwjanuary11! I mean like you said you care but you don't care. Either in the dojo, or on mountains. And no, they are not family. This is not really a cheat, but it is still cool! Cool! I have the game too! It is cool! I was supposed to meet her! :-| But I can't, sorry Polka! Cause of the time zones i'm not coming on at midnight! I know it's not a new room. It has to be the mission. Kool! I wanna meet her! My party is on Sunday everyone! But I gotta figure out a time! Well, the broken tower clock, the earth quick, they were all shown in CP. So i think it might be a mission. Yes, always burning nice and bright! I dont think so, no such thing as Card Jitsu-Earth. I emailed them about it and they said it is not real. They are all at the hideout. I'm hungry so I will eat spaghetti for breakfast. hey im new to clubpenguin and my penguins name is really cool,but my name isnt showing up....it just says P and some numbers. Please tell that will go away. It might be the new mission,party or something new coming up. Looks like i was right a possible new room. Has anyone seen Lion King 1 1/2? We could sing "Dig a tunnel, dig dig a tunnel!" while we are digging! Lol! Lucky! I was sick and didn't go to school today... It COULD be Herbert digging a tunnel, or something else! it is purty suspicious! No because you weren't the first one to tell him. Hey mimo just asking but how did you do the perion points (.)? He lives at the dojo, have you ever seen him not there? Second, yes. They are in the penguin family. GUYS! Big trouble! I'm banned on CP 72 hours! Sorry Januwary! I can't make it to your party now! Guys! If I get banned 1 more time, don't I get banned for ever? Someone please answer. I'm really scared! I don't know what to do! Whoa! Nice find cheat helper and mimo for posting! If you look at one of club penguins old post you will notice herbert, a puffle, and the squid in question marks. I think the puffle is going to be in the new mission. Remember in one of the old missions herbert said he was going to do something with the puffles? My penguin name is Blue92713. Oh no! BE careful! If you get banned again you maay be banned forever! Make a new account! Yeah! Wait...how did u get banned? ADVERTISEMENT! K sort of. Click on Polkadotblu9's name, and once the thingie pops up, click Club Penguin Cheats, you are on a great site! We are on a mission to get it as popular as CPG, please help out! Same for Kkkkkk123! Click her name then click Club Penguin Fans! They are both great sites! Please help out! I haven't been there for a while. I would say it's Herbert. I never noticed but on the mission avalanche rescue the map is the OLD cp map if you ever wanted to see it. It could be a secret room. I think that we will find cave men drawings and that we will have a cave men celebration after finding them! I doubt it because sadly my membership ends tomorrow :'(. I can't believe I'm saying it...but I miss being a non-member. Apparently very soon! I'm still on the first one. this is the longest I ever took on a Mimo Clue! Awesome!! It was 27 degrees here and when I stepped outside, my driveway was covered with ice, and I slid down!! Probably this is one of Herbert's plans digging underground looking for something. Im not sure but he's sure lookin underground in a driller. Yes, always. It is the eternal flame! Lolz. I see the problem here. You're new to Club Penguin, right? And it says P and some numbers. They're just approving you're name. Making sure it's not inappropriate. If it is, you're penguin name will stay like that. He gave a tour, didn't type it. Sensei lives in the mountains in the dojo, in the hidden part that wasn't made till the big construction. But I think that is his house. I Reckon it's the new mission, Because remember at the end of the Mission 10 When G Found that Seed thing, Maybe herbet planted one and now its Making roots and its gonna collapse The mine! Or Humans Come to Club Penguin and Start to Try and make it like there old area! Starting with the first things like, Wait for it, Wait for it, CAVE MEN Maybe Cavemen from Another Country *assuming there are other countrys on club penguin* sent cavemen to Take over Club penguin! OH WOW!! Im not allowed to be on much, but every now and then im allowed on.On the 17th I will be very active. Digging perhaps? Maybe herbert is trying to find that stone puffle from adventure party 09!Lolz! WHOA! :O This is serious! I have never been banned be4, but I have a solution:Just be careful of what ur doing on clubpenguin.Sometimes they make mistakes of banning ppl. Awesome!!!! I think that Herbert is NOT behind this because its so small. I think Herbert would go much much bigger. I can't get club penguin to load! What do i do? Don't worry, that will be gone in a few days. Replaced by your penguin's name. The p stands for penguins and the numbers show what number penguin you are I belive. Yes it will go away very soon. Just you wait and see. It happens to everybody. I think your right! Being a secret agent on clubpenguin is harder with that poler bear around! Someone needs to stop him! The packet that Herbert must something for the puffles that will (maybe) make them evil or something? i bet this has to do with the new mission but didnt herbet get banned from the island in the waddle squad mission? Rock on U2 (the band) ur awesome as cookies'n'cream lipgloss!!! Aww poor you, my brothers little brothers school was like one of the only schools in Norfolk still open, I think Herberts buildin a cave, cos there is gonna be cave furniture out on the 15th. Rock on U2 (the band) you rock my sox!!! i wish it is herbert coz i want a new mission! there havent been a mission since a long time! Don't worry, i'm sure you'll figure it out! Good idea! I was about to put the same but then i totally forgot! LOL,but wouldn't there be hazards around the island like on a mission on Club Penguin EPF? I tried to dig for 5 minutes but nothing happened. I think it requires a team of diggers. Well, I did some research, and what I came up with was that your name will take some time to register or confirm. That is because when the mission was released, the map was still the old map. Then CP added stuff to the map, but didn't change the mission's one. Wow. I always just thought the centre gem was a hole... whoops. I think it is just a rock, as the floor thing in the ninja hideout doesn't have like a earth mark or anything. Hey Mimo! Sorry I haven't been modding. I've had a ton of homework and projects. Yeah!We Would All Love That.I Hate Waiting For Missions. I haven't been on cp for a few days- my Internet hasn't been working right. I usually check cpg for an update daily, so when I saw this new update I grabbed a computer and started working away! I'll be in the mine on white house working away if you look for me! I like Kkkkkk123's site better. But both are very well done. I remember one time Club Penguin had an earthquake, and it was related to a mission... So, things in missions don't get put into CP, but things in CP get put into missions! Those two things are not the same. your idea makes sence and i believe it except with the boiler point but the seed pack could be o berrys with epf puffles. Does that count as a cheat? And anyway, a lot of people could have seen it but made no notice as it wasn't a cheat. Maybe Mimo might post it, but it isn't really such a big deal. Cool, do u guys go on a certain server, or do u go on random servers?